I don't know why, but for some reason the minute the wheels on our plane hit the tarmac in Los Angeles, my my style seems to automatically change. Not dramatically, mind you, but there is something about the warmer temps, the tans, the relaxed vibe, that makes dressing up seem, well, so unnecessary. Things like make up, blowouts, heels, structured jackets. Forget about it! Nope, when I get here, I become the queen of maxi skirts, sundresses, and yes, yoga pants for days at a time. It just feels like getting all fancied up is such a waste of effort, and I am just not about to waste that kind of time when there is this much beach walking to do. 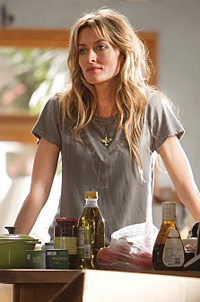 If there was any Cali girl who's style I would love to adopt (ahem steal) it would have to be the uber fabulous Karen (aka Natascha McElhone) from one of my favorite shows, Californication. 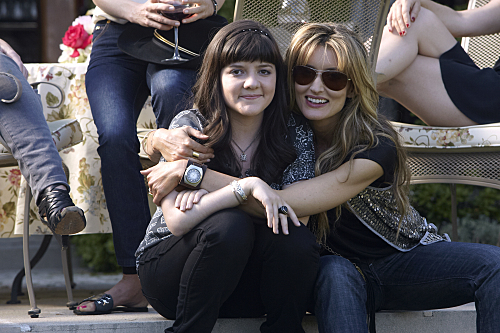 Her style is the epitome of California cool, with the perfect mix of bohemian flair, and East Coat chic. I love the way she accessorizes with funky jewelry, and how she always looks so effortless. Add in that to die for hair... and this is one look I want from head to toe. Saturday, I will be back in the land of Winter coats, so for now I'm throwing on my favorite denim shirt, patterned silk scarf, maxi skirt, and of course, leather sandals as an ode to my new style guru. 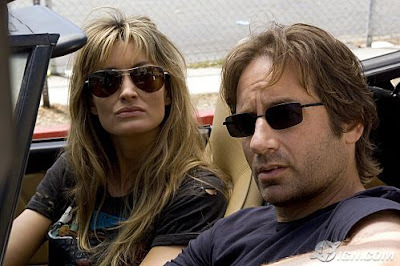 Now if I could only get David Duchovny on my arm... that is one PERFECT accessory!